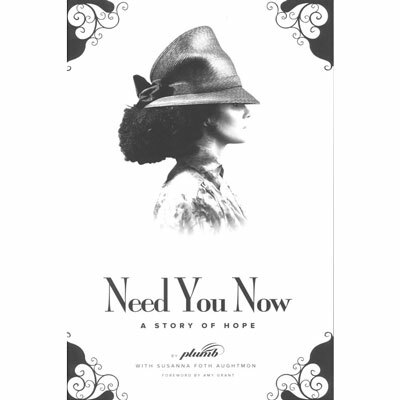 Need You Now: A Story of Hope is the deeply personal, incredibly honest, and hugely encouraging new book by recording artist, songwriter, and performer PLUMB aka Tiffany Lee. Equal parts revealing memoir and inspirational literature, each chapter reveals a day in the life of a rock star, inviting you into Plumb's personal journey of embracing her life's passion of music and her very real, all-encompassing love for her family and community. Both laugh-out-loud funny and deeply moving, Need You Now is the story of beautiful and embarrassing moments on stage, the joys and trials of motherhood and unbridled forgiveness. It is the story of soul mates, best friends and a marriage redeemed. And more than anything, Need You Now is the story of love, fresh starts and the relentless message that no matter who you are or what you have done...there is always HOPE. Co-Author and speaker Susanna Foth Aughtmon is the mother of three and the wife of Scott, the lead pastor of Pathway Church, in Redwood City, California. Using humor, authenticity, and the truth of scripture, she connects with her readers through her many books including, I Blame Eve: Freedom from Perfectionism, Control Issues and The Tendency to Listen to Talking Snakes.